Primary Approved Dresses and skirts! I know the topic of singing time wardrobe (and wardrobe malfunctions - thanks for the occasional laughs, by the way!) has been thoroughly discussed over on the Choristers FB page. It's very apparent that finding dresses and skirts that wear well with this calling is challenging. You need something that won't reveal all during all those wiggle songs (check out my Wiggle Worm Jar HERE if you're unfamiliar with that), and something that can handle Primary Yoga (check that popular activity out HERE if you don't know what I'm talking about!). Not to mention super stretchy so you can comfortably sit on the floor with your nursery kiddos! If I can get away with not layering, it's a real added bonus as I know I'm not the only one who occasionally goes home hot and sweaty ;). Liz at cleomadison.com recently contacted me about trying out one of their modest dresses or skirts and I thought primary would definitely put it to the test! I mulled over the website and discovered that their clothing dress and skirt lines would work really well for singing time. The hemline on all their skirts and dresses is longer and their neckline on the dresses will let you comfortably bend forward! 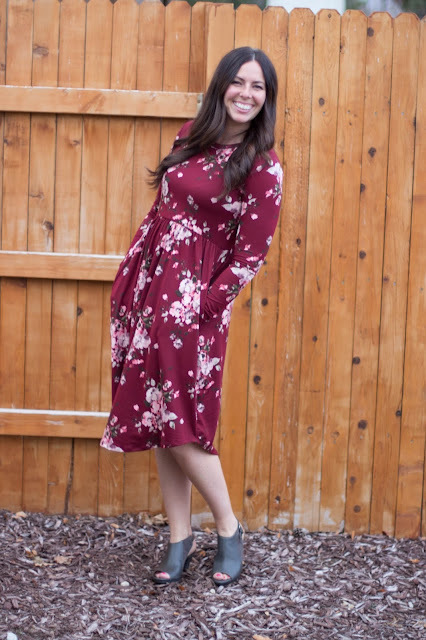 And after receiving my dress (I got the Tokyo Floral Dress HERE, size Large, as I fit between an 8-10), the fabric is really stretchy (my post baby-body needs lots of stretch lately!) and soft. Then to top it off, it has pockets!! This is so comfy I don't even come home immediately after church and yank it off! I live in Utah where it's easier to find appropriate church clothes and I still struggle finding dresses that will wear well in primary. I can only imagine the struggle for those living outside of Utah. So if you are looking to increase your primary Sunday wardrobe, I'd highly recommend checking out cleomadison.com. Do you have a favorite dress or skirt that you wear for primary? Where did you get it and what do you love about it? I'd love to hear! Thank you for this post. I checked out the CleoMadison website and ordered a couple dresses, thanks to you. :) LOVE LOVE LOVE your website and refer to your posts nearly every week. Thank you for making my calling easier and more fun. I love this post! Thanks for sharing. Wiggle time in primary can be a little rough if you didn’t dress appropriate. I havn’t struggled to much with this but I have noticed some past choristers leave out the wiggles on purpose because they don’t want to wear longer dresses. I totally want to get some of those dresses because they are so adorable and you look so cute in your picture! I just wanted to thank you for helping me develop confidence in this calling. I love your website and I don’t know what I would have done without it when I was called about 6 months ago! Your awesome!! !